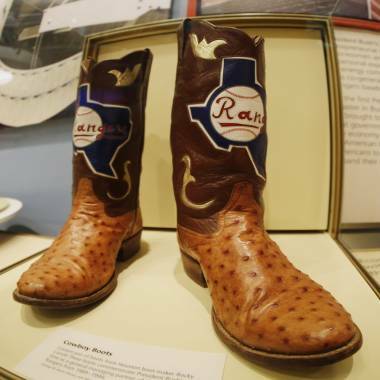 With its dedication set for Thursday in Dallas, the George W. Bush Presidential Library and Museum is about to join an impressive collection of institutions which commemorate the nation's former commanders in chief. These libraries -- now 13 in all -- cost taxpayers $75 million to operate in the last fiscal year. In the era of sequestration, almost all spending is under increased scrutiny, but of particular interest is the private financing that helps pay for these presidential libraries. They are built initially with private funds collected even while presidents are still in office. And some lawmakers have taken issue with the way that cash is raised, fearing special influence in the White House for those who open their checkbooks. 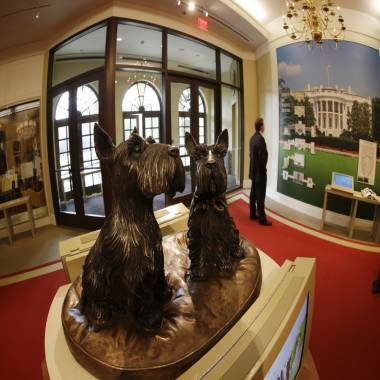 Busts of presidential pets Barney and Miss Beazley are seen during a tour of the George W. Bush Presidential Center on April 24, 2013. The presidential libraries are public-private hybrids designed to preserve the papers, and to some extent, burnish the reputations of all the presidents since Herbert Hoover. After their privately financed construction, they are turned over to the National Archives and Records Administration (NARA) to be operated with a mix of private and public money. In the past year, nearly two million people visited these institutions. Federal law dictates that when a new presidential library is turned over to NARA, an endowment must be provided by the foundation to offset some of its operating costs. The amount of the endowment provided by the George W. Bush Foundation for the new library is nearly $9.8 million. But the fundraising for these institutions begins before a president even leaves office, and that's where the real questions begin. During Bill Clinton’s presidency, songwriter and Democratic donor Denise Rich pledged $450,000 to the building of the Clinton library. In his final hours in office, Clinton issued a pardon to Rich’s ex-husband, fugitive commodities trader Marc Rich, who had fled to Switzerland in 1983 before being indicted on fraud and tax evasion charges. Lawmakers from both parties condemned the Rich pardon, with Sen. Charles Schumer, D-N.Y., saying it “makes a mockery” of the U.S. justice system. Clinton later portrayed his pardon of Rich -- a prominent supporter of Israel -- as mostly a response to urgings from former Israeli officials like Ehud Barak and from Jewish community leaders in the United States. And Clinton aides, including John Podesta, denied that there was any quid pro quo in the Rich pardon. Denise Rich is seen in this 2012 file photo. During Bill Clinton's presidency, she pledged $450,000 to the building of his library. Rep. John Duncan, R-Tenn., has re-introduced a bill he first offered in 1999 which would require any organization that raises funds for a presidential library to disclose the sources and amounts of that funding. The legislation would apply to foundations that receive $200 or more per contributor per calendar quarter while the current president is in office and during the period before NARA takes possession of the library. Duncan said he proposed his bill in 1999 after hearing that foreign governments were making donations to the planned Clinton presidential library. “However, this is not a partisan issue. I introduced and have supported this legislation under both Democratic and Republican presidents,” Duncan said last month. While a commander in chief is still at the White House, his allies will set up a non-profit foundation and begin raising money for the construction of the soon-to-be ex-president’s library. Generally donors do not need to be publicly disclosed, so in theory a foreign government or person with interests pending before the federal government could chip in money. But a 2007 law does require disclosure of contributions to presidential library foundations from registered lobbyists who contribute $200 or more. According to a 2010 Congressional Research Service report, the disclosure requirements also apply to organizations employing registered lobbyists and political action committees (PACs) maintained or controlled by lobbyists. When reporters asked White House spokesman Jay Carney this week about Duncan’s disclosure bill, he said he wasn’t aware of the legislation and that Obama has said nothing about his future library. “He’s not focused on his life after the presidency,” Carney said, adding that he did not know of anyone inside or out of the administration who is working on plans for a library. When he ran for the 2008 Democratic nomination, Obama watched his rival Sen. Hillary Clinton during an NBC debate in New Hampshire having to field questions about donors to her husband’s library in Little Rock, Ark. She that she’d co-sponsored a bill to require disclosure of donors to presidential libraries. In late 2008, after Obama nominated Clinton to be secretary of state, the Clinton foundation agreed to voluntarily disclose names and donation ranges of its contributors. That information can be found on its website.